"Why did I agree to go on this crazy quest with you guys? Find eco... save the world... I wanna go home!" 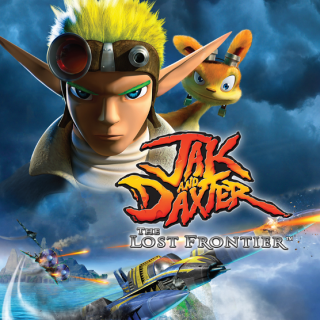 The sixth installment in the Jak and Daxter series developed by High Impact Games and co-developed by Naughty Dog and the first game in the series to be released to a console outside the Playstation 2, the PlayStation Portable. The game is set a short time after the events of Jak X with Jak and Daxter helping Keira on her quest to finally become an eco sage, like her father Samos. On top of this, the trio are also on a mission to solve the eco crisis that has caused the planet to slowly kill itself due to a sudden shortage in eco making remaining eco unstable. With their sturdy, customizable Hellcat they travel to the Brink in search of more eco, where they're suddenly attacked by eco pirates led by Captain Phoenix. The confrontation causes the Hellcat to leak fuel forcing them to make a crash landing on a nearby island. While mostly made by a different developer, the mechanics of the earlier games are still present within some of Lost Frontier's gameplay. Jak's sections are still focused on a mix of linear platforming segments and fast paced gunplay with new unlockable eco powers that add variability to the platforming and combat. Jak's Dark Form from the previous games is no longer present with his abilities instead focused on the four other types of eco introduced in the The Precursor Legacy. Daxter's sections have changed with the introduction of his own Dark Form, aptly named Dark Daxter where he can fire dark eco energy balls, gains super strength and a vicious cyclone attack. However, the majority of the Last Frontier's gameplay departs heavily from previous installments with the introduction of airship gameplay, which has a heavy emphasis on customization and vehicular activities. You have an airship in the form of the Hellcat you start the game with and other ships you gain as the story progresses which you will use to traverse the Brink, access the various hub worlds to upgrade your ship and Jak, complete side quests, and battle Sky Pirates. Each ship is unique in how it can be customized and will require special unlocks to be used to their full potential. Like previous games in the series it received mostly positive reviews, but was a huge Base Breaker with fans of the original trilogy and didn't sell as well as previous titles. Absurdly Spacious Sewer: Aeropans sewers which host some of the levels you play as Dark Daxter. They're pretty big but nothing compared to Haven's sewers in II and 3. A.I. Is a Crapshoot: Tym built a large number of robots to help him survive on Brink Island, but they all became hostile. Bag of Spilling: Jak doesn't have as many abilities as he did in Jak 2 and 3. The loss of Dark Jak and Light Jak is explained by the instability of eco, but there's no reason for Jak to leave behind his Morph Gun, Precursor armor or Jet Board. Badass Baritone: Dark Daxter has this. BFG: Jak's gunstaff which he finds mods for throughout the game, just like the Morph gun from Jak II and Jak 3. Body Armor as Hit Points: As in 3, armor increases your maximum health. There are five sets of armor in the game, with the strongest (Dark Sage's Mail) only becoming available on Hero Mode. Bullet Time: The Eco reflexes power. It is functionally equivalent to the Light Eco power Flash Freeze in 3 (though that involves slowing down everything else, rather than speeding Jak up). Canon Discontinuity: The game appears to be generally ignored during crossovers, with Jak's appearance usually taking after his Wastelander look. About the only thing that got carried over is Josh Keaton returning to voice Jak in Play Station All Stars Battle Royale, and even then, it might have simply been easier to hire him. Deflector Shields: The Eco shield power. It is similar to the Light Jak power Light Shield in 3, but it causes Jak to roll around as if he were in a physical ball (Light Shield allows him to move around normally) and stops him from using melee attacks (while Light Shield disables shooting). It also allows Jak to cross Dark Eco pools safely. The Hyper mutant has a Dark Eco equivalent to this power. Everything's Better with Spinning: Dark Daxter's cyclone attack. Jak also gets an upgrade for his spin attack that briefly makes him invulnerable to projectiles. The Gods Must Be Lazy: The Precursors already had hints of this in Jak 3, but its Up to Eleven with the Brink which is a whole section of the world they simply didn't finish making. Giant Spider: The Ghoul spider enemies. Strangely, they only have four legs instead of eight. Heroic Sacrifice: In the final battle, Phoenix flies the Phantom Blade in between the Behemoth and the Eco Core, stopping the former drawing power from the latter and allowing it to be destroyed. Infinity +1 Sword: The Jaguar, objectively the best plane in the game. It has many weapon slots, high durability, and is faster than its size would suggest, and also has many mod slots as well. To balance it out, it's unobtainable on your first playthrough. It can only be obtained on Hero Mode and requires you to find its five components first. Killer Gorilla: One recurring enemy type, which also makes up two bosses, are apes which were mutated by Dark Eco, turning them aggressive. Mecha-Mooks: These are fairly common enemies. They come in three varieties: the sawbots (have two circular saws and were originally built to cut down trees), the tripodbots (three-legged and armed with lasers) and drillbots (have drills and blasters; presumably built for mining). Mechanical Monster: The Uber-Bot 888, a massive robot that serves as a boss. It has sawblades, a laser cannon, and armor that makes it Immune to Bullets (requiring you to use your Eco Amplifier to destroy it). More Dakka: Upgrades for your ships. For example the Sky Raider can be fitted with three machine guns. Morph Weapon: The Gunstaff takes the place of the Morph Gun used in previous games. It has four forms: the Blaster, Scatter Gun and Vulcan Fury return from previous games while the Lobber is essentially a Green Eco equivalent to the Plasmite RPG of 3. Multiform Balance: The four forms of the Gunstaff are all suited for different purposes. The Blaster has long range and high damage, the Scatter Gun is a Short-Range Shotgun that can hit multiple enemies but only at close range, the Vulcan Fury has the highest firing rate and ammo capacity (notable in that in previous games, its ammo capacity was equal to the Blaster's) and the Lobber is a powerful grenade launcher with low ammo capacity and poor rate of fire. New Game+: Hero Mode. Unlike in previous games where you needed to buy it, here you unlock it simply by beating the game. You can replay Hero Mode an infinite number of times. Ninja Pirate Zombie Robot: Ghost pirates show up in Sector Zero as enemies. Riding the Bomb: Three times in one mission. It's basically an extended Daxterjacking sequence followed by manoeuvring a clunky missile past defensive mines. You can get side missions off Dirk Hardpec. Just to drive the point home, you can also encounter a ghost pirate in Sector Zero named Thick McRunfast. To Dr. Strangelove: When Daxter finishes the missile-riding mission, he'll wisecrack about wanting a "missile hat an' spurs". Spin to Deflect Stuff: One upgrade allows Jak's spin attack to reflect enemy projectiles. Stuff Blowing Up: The Eco Amplifier power. It takes the form of a red orb of energy that slowly floats forward and explodes when shot. The Hyper mutant has a Dark Eco equivalent to this power. Its version manifests as a purple orb around its fist that explodes when it punches the ground. Super Drowning Skills: Jak has them this time. Despite having no trouble swimming throughout the whole original trilogy. Superpowered Evil Side: Unlike previous games, Jak can no longer transform into Dark Jak due to the instability of eco. Daxter, on the other hand, can now transform into Dark Daxter after absorbing Dark Eco. Dark Daxter is even bigger than Dark Jak (despite starting out far smaller) and can throw Dark Eco bolts, pound the ground to make a shockwave, pick up and throw enemies, and spin rapidly to become invincible. Super Speed: The Saucy Pirate is a boss who can run incredibly fast, requiring you to use Eco reflexes to keep up. The Hyper mutant can temporarily increases its speed using its own Eco reflexes power. Worthy Opponent: Phoenix clearly sees Jak as this.